Excerpted from "Beyond Words: What Animals Think and Feel"
“Why doesn’t Batman just kill the Joker?” Without looking at me, Rick McIntyre quizzes me like a Zen master during one of the strangest conversations I’ve ever had. He’s trying to lead me into a realization about the roots of mercy by talking about superheroes as we’re looking through telescopes in subfreezing weather while watching wolves eating an elk a mile away on a frozen, snowy slope. Rick, a ranger here in Yellowstone National Park, conducts the whole conversation without taking his eyes from his scope. Rick follows free-living wolves every day. I’ve never seen real wolves before, so my eyes are glued to my scope too. “If ever there was a perfect wolf, it was Twenty-One,” says Rick, using the wolf’s research-collar number as his name. “He was like a fictional character. Wolf territorial fights resemble human tribal warfare. Wolves often target the rival pack’s alphas, seemingly understanding that if they can rout or kill the experienced leaders, victory will be theirs. Twenty-One distinguished himself in two ways: He never lost a fight, and he never killed a vanquished rival. But why? A wolf letting vanquished enemies go free seems inexplicable. Rick’s question about Batman and the Joker is his koan-like way of trying to lead me to a big-picture explanation as to why. But I’m not getting it. Rick is saying that history’s highest-status human leaders are not ruthless strongmen like Hitler, Stalin and Mao. They are Gandhi, King and Mandela. Peaceful warriors earn higher status. Muhammad Ali — who has been called the most famous man in the world — was a practitioner of ritualized combat who spoke of peace and refused to go to war. His refusal cost him millions of dollars and his heavyweight title, yet with his refusal to kill, his status rose to unprecedented height. For humans and many other animals, status is a huge deal. For it, we risk much treasure and blood. Wolves do not understand why status and dominance are so important to them, and for the most part, we don’t either. In wolf and human alike, our brains produce hormones that compel us to strive for status and assert dominance. Dominance feels like an end in itself. We don’t need to understand why. Here’s why: Status is a daily proxy for competition. Whenever mates or food are in short supply, the high-status individual has preferred access. What’s at stake is survival, and ultimately, reproduction — the chance to breed, to count. Our genes don’t need to let us understand why; they just need us to want it. One could hardly expect that wolves would understand, any better than we do, what drives us all. But I still don’t get what this has to do with Batman. But could wolves have such an ethic? If a human releases a vanquished opponent, the loser’s status suffers anyway and the victor seems more impressive. You’ve already won and you show tremendous added confidence. If you show mercy, you gain even more status. But could a wolf be merciful? A wolf might be a super-animal, but he ain’t no superhero. One day, Twenty-One discovered Casanova among his daughters. Twenty-One caught him and was biting him. Various pack members piled in, beating him up. “Casanova was big,” Rick says, “but he was a bad fighter.” Now he was totally overwhelmed and the pack was finally killing him. “Suddenly Twenty-One steps back. Everything stops. The others are looking at Twenty-One as if saying, ‘Why has Dad stopped?’” Casanova jumps up and — runs away. Casanova kept causing problems for Twenty-One. So, why doesn’t Batman just kill the Joker so he simply doesn’t have to keep dealing with him? It doesn’t make sense — until years later. After Twenty-One’s death from age, Casanova became the model of a responsible alpha male. Though he’d been averse to fighting, Casanova died in a fight with a rival pack. But everyone in his own pack escaped — including grandchildren and great-grandchildren of Twenty-One. Wolves can’t foresee such plot twists any more than can people. But evolution can. Anything that’s helped descendants survive will remain in the genetic heirloom, a driver in the behavioral toolkit. So, say you’re a wolf; should you let a beaten rival go free? I think the answer in both wolves and in our own tribal human minds is: Yes — if you can afford to. Sometimes, your rival today becomes, tomorrow, a vehicle for your legacy. Perhaps that is the basis for magnanimity in wolves, and at the deep heart of mercy in men. 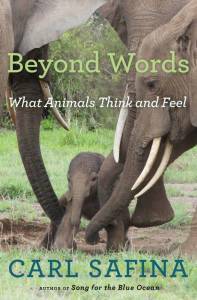 Excerpted from "Beyond Words: What Animals Think and Feel" by Carl Safina, published by Henry Holt and Company LLC. Copyright © 2015 by Carl Safina. All rights reserved. Carl Safina's work has been recognized with MacArthur, Pew and Guggenheim fellowships, and his writing has won Orion, Lannan and National Academies literary awards and the John Burroughs, James Beard and George Raab medals. Safina is founding president of the not-for-profit Safina Center at Stony Brook University. He hosted the 10-part PBS series "Saving the Ocean With Carl Safina." "Beyond Words" is his seventh book. He lives on Long Island, New York.